You tend to expect a certain thing from Captain America stories. He will be a solid moral hero. He will likely take part of solo adventures that are in military settings. There will be a shield! He is grounded, literally on Earth. In Captain America: Castaway in Dimension Z Book One, Rick Remender throws us for a loop sending Cap into an adventure not even in our universe. It is Steve Rodgers 90th birthday. And he celebrates by battling the eco-terrorist the Green Skull! After defeating this villain, he is met by Agent Sharon Carter his S.H.I.E.L.D. liaison and girlfriend. Carter has asked Rodgers a key question, will you marry me. Rodgers is thrown by a woman asking the question since that was not how it was done in his day and fears becoming a family man when his life as a hero is full of danger. 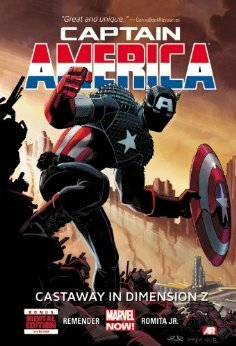 The future of Carter and Rogers’ relationship ends as Captain America boards a subway train that carries him into Dimension Z. There he battles Arnim Zola, looking much different than the MCU version, the lord of this dimension of genetically modified beasts and aliens. Cap escapes and liberates Zola’s generically designed son who Rogers names Ian. Rogers spends the next 11 YEARS traveling back to Zola’s workshop raising his adopted son Ian and seeking a way home. Along this journey Ian and Cap join a tribe of natives named the Phrox who all work together to survive Zola’s predators and Ian’s sister Jet. Okay, this has to be obvious. But some sort of time bending, hallucination, I’m dreaming scenario has to be developing here. Somehow this story has to end with whatever happened in Dimension Z occurring in seconds, minutes, or at least only a few days. Quite simply Captain America cannot be away from the Marvel 616 for eleven years. This is especially true since during his time in Dimension Z he still leads the Avengers in other titles. So I am expecting a Dallas shower scene equivalent to occur here (who remembers that one kids)! But despite the comic book physics which must occur this story is still pretty cool and different. And it is interesting to watch Rodgers grow older and mature as a man while raising Ian and sharing his values. This story also is a nice change of pace. Captain America fights monsters. Captain America lives Survivor. Captain America goes native. In many ways this is Captain America’s version of The Road where a father against incredible odds struggles to raise a son while teaching both survival skills and a moral compass. If anything it is the fatherhood aspect that makes this story the most interesting and different. Interacting with a son is really something we have never seen Rogers do. We have ton of stories where he kicks back with Tony Stark, but this is a completely different dynamic. Here is what I want. I want a happy ending and a whole new start for Steve Rodgers. I want him to escape and somehow escape with some version of Ian. I will admit I do not know how Rodgers could revert to 90 and Ian still retain memories of his dad. And I want him to accept Sharon Carter’s proposal. If Clark Kent and Peter Parker can be married, even short times, why can’t a symbol of moral masculine virtue take the plunge? Captain America: Castaway in Dimension Z Book One is a very different Captain America story. Cap is alone. He is not in a leadership position, expect to one key person. He is not battling Red Skull or HYDRA. No he is trying to find food. This is not a spy story. But placed into the role of a father, Remender has created a situation for Steve Rodgers where he can grow in new directions.